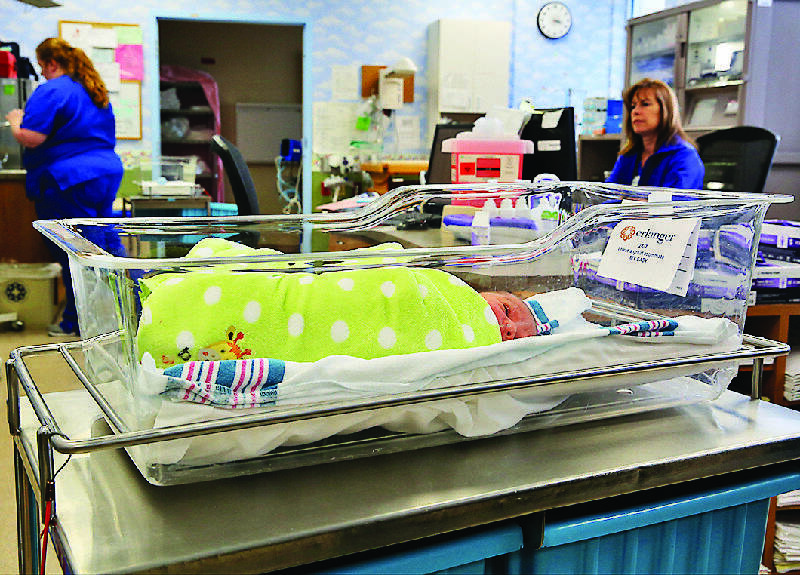 Andrew Jace Gaconnet, 1 day old, waits to be taken back to his mother in the Well Baby Nursery at the Baroness Campus at Erlanger Health System on Wednesday, January 23, 2014. Newborns go through genetic screening tests administered shortly after birth to test for diseases that may not have been previously detected. Tennessee health officials are moving to bring more safeguards and scrutiny to the process of newborn screenings. Extended lab hours, a contract with a courier service and a new public reporting system are all new features the Tennessee Department of Health hopes to implement in coming weeks to better ensure that the newborn tests are received and processed promptly. "There's always room for improvement, and we're striving to give our hospitals timely information so that if they do see problems they can address this," said Dr. Richard Steece, director of the Tennessee Department of Health's Division of Laboratory Services. "I see very positive outcomes from these changes, for everyone." The need for more accountability in the system of screenings has been recently spotlighted by an extensive investigation by the Milwaukee Journal-Sentinel that revealed serious delays in some hospitals' handling of the screenings, and examined holes in how states held those hospitals accountable. In the national report, Tennessee was shown to be one of 14 states that did not release information about hospitals' potential delays, was a state that had no clear standard for how the specimens should be transported and did not have its lab open during the weekend. Dr. Michael Warren, director of maternal and child health for the Tennessee Department of Health, said his department has been eyeing changes to the screening system for some time. But he noted that the timing of the national story made the topic especially ripe for the state's recent Genetic Advisory Committee meeting. "The issue was presented to them because of the attention that had been present around this issue nationally," Warren said. "We had this topic of transit times on the agenda, and we used that as an opportunity for telling them what we were doing." Newborn screenings -- drawn from a few drops of blood from a heel prick within the first two days of a baby's life -- have been in place since the 1960s to detect disease. Tennessee hospitals ship off the blood work daily to the state lab in Nashville, where it is tested for two dozen conditions, including genetic diseases like cystic fibrosis and sickle cell anemia. Quick turnaround for test results is crucial for detecting some disorders that move swiftly, causing disability or even death in the first few weeks of life. One in 800 babies is born with such illnesses. In 2012, at least 160,000 blood samples from newborns nationwide arrived late at state labs, the Journal-Sentinel's analysis found -- delays that sometimes led to severe disability or death. But it remains unclear how Tennessee hospitals perform on timing. While Steece said the state lab monitors hospital transit times, it has not typically or regularly reported that information to hospitals. If hospitals are showing a pattern of delays, the department works with them, but the hospitals are not penalized. In Georgia, where the tests' transit times have been made public, about 4.7 percent of the samples took six or more days to reach the lab. The new Tennessee reports, which will likely start going to hospitals in August and be publicly reported later in the fall, will cover several topics: the percentage of babies born who are actually tested; whether the tests were collected correctly; and transit times -- something that has never been included. "That's a lot of data to record in a meaningful way," said Warren. "We want to make sure what the hospitals are getting is actionable." The courier service, which was scheduled to go out to bid last week, will eventually shuttle specimens from hospitals statewide to the lab in Nashville overnight. The plan is for the service to be quicker and more secure than U.S. Postal Service or FedEx, which Erlanger Health System and Parkridge East Hospital, respectively, have used to send their tests. The service would be free to hospitals, officials say. In Georgia, samples must be sent by courier, overnight delivery, or express mail, the Journal Sentinel report found. Georgia's state lab pays for one UPS shipment each day from each hospital. In extending the lab's work week from five days to six, Steece said the lab will be able to better keep up with the tests from babies born later in the week, and will cut down on the Monday backlog. "In Tennessee we haven't had any major issues with delays on the testing side," Steece said, "but of course this will improve our testing and our turnaround."